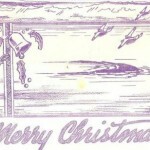 Many Wake Island men sent cards and holiday gifts by ship’s mail in late November 1941, timed to reach loved ones at home just before the upcoming Christmas holiday. Some of the fellows reached deeper into their pockets to pay airmail rates and sent their cards on the eastbound Pan American Clipper. Despite the war clouds gathering over the Pacific, few on Wake worried that anything would hold up the mail unless Mother Nature cooked up another typhoon in the neighborhood. 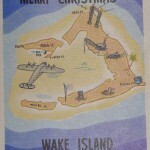 The Wake “multigraph” machine churned out cheery cards for employees to use: one colorful cover featured a palm tree (despite the fact that Wake Island had none) and a fish leaping from a blue sea with the words, “A Merry Xmas and a Lucky 1942” framed by the V-shaped atoll. Other cards depicted variations on the atoll theme and contained a heart-felt poem. 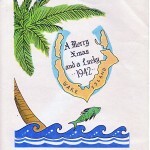 As the last peacetime ships and planes carried the Christmas mail eastward, “all the fixin’s” for a grand Christmas feast made their way westward to Wake Island. Reefers packed with food and boxes of fancy menus had been loaded onto the USS William Ward Burrows in Honolulu and the ship steamed toward Wake during the first week of December. 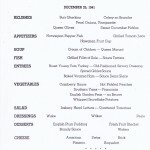 The menu revealed that the hard-working construction crews would be treated to a multi-course meal opening with relishes, appetizers, soup, and fish, climaxing with roast turkey, baked ham, a variety of vegetables and sides, and finishing with desserts, cheeses, fruits, and candy. The big feast never made it to Wake Island. 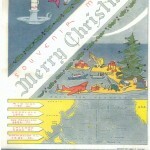 When the Pacific erupted in war censors clamped down on mail moving through Honolulu and it was weeks before the eastbound Christmas cards found their way to mailboxes on the mainland. By then families knew that their men were in terrible danger, or worse. For some families, the Wake Christmas card and poem was the last mail they ever received from their loved one. and civilian groups the captives moved into the remnants of the barracks. It was not to be a “Lucky 1942” for the men of Wake Island or their families.